The central research topics of the group of Peter Hoor are related to transport and mixing processes affecting the tropopause region or the extratropical upper troposphere / lower stratosphere (ExUTLS, see e.g. Gettelman et al., 2011). 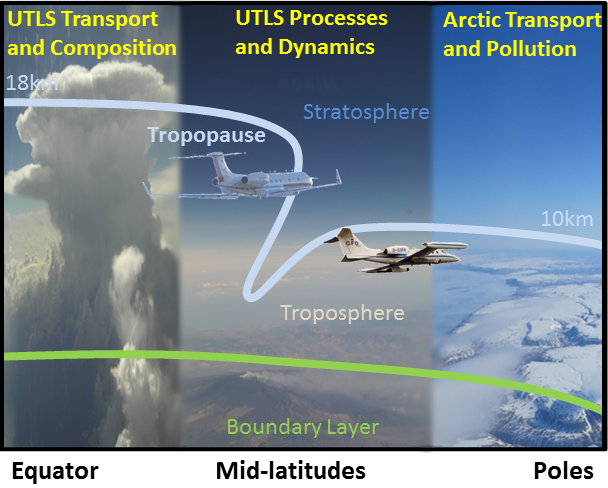 Changes of the distributions of trace gases, like water vapor, ozone and ozone depleting substances, and thin cirrus clouds in the upper troposphere and lower stratosphere (UTLS) strongly impact radiative forcing of the Earth's climate and surface temperatures (Solomon et al., 2010), and are of key importance for understanding climate change (Hegglin and Shepherd, 2009; Riese et al., 2012). Transport and mixing in the extratropical upper troposphere / lower stratosphere (ExUTLS) play a key role for the quantitative understanding of the distribution of these radiatively active species (Riese et al., 2010). The formation of the extratropical transition layer (ExTL) around the tropopause, which exhibits chemical characteristics of both the stratosphere and the troposphere (Hoor et. al, 2002, 2004; Pan et al., 2004), is a direct consequence of the underlying frequent small scale mixing processes.